Secure your server workloads in the cloud. Businesses need to confidently migrate their legacy applications while deploying new cloud-native applications and services. However, many businesses struggle to detect compromised accounts and instances, and configuration loopholes that expose sensitive data and applications to attackers. Cloud workload security solutions allow businesses to discover, monitor, and secure cloud accounts, compute and storage instances, and the control plane. This makes it possible to develop and deploy more applications at scale, while reducing the risk of introducing security issues and improving overall security and compliance posture. Trend Micro Deep Security, powered by XGen, offers cloud protection that scales and helps businesses maintain continuous compliance. 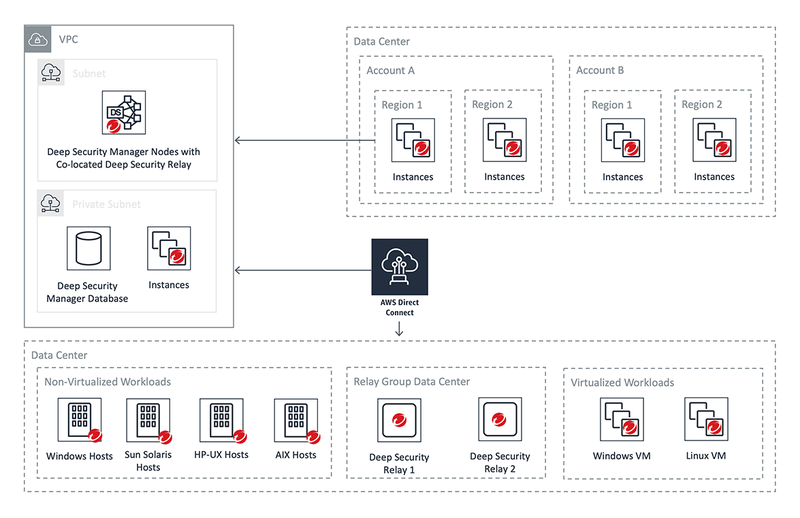 This solution provides a comprehensive suite of cloud security capabilities from a single agent, with affordable pricing to keep pace with elastic workloads and containers. Using Deep Security customers can protect their physical, virtual, or cloud resources with an agent or Trend Micro’s virtual appliance. HIPAA-compliant cloud solutions provider Cloudticity needed a security solution that offers a consolidated view into all areas of a company’s security, automating repetitive tasks, immediately securing new AWS instances, and producing reports for auditors. To accomplish these tasks, Cloudticity selected Trend Micro Deep Security, which reduced the time and resources needed to secure client data. Trend Micro’s focus on continued improvement and automation has helped Cloudticity drive growth. Deep Security’s ease of deployment and operation frees up time for Cloudticity to focus on other priorities, like developing new customer solutions and growing the business. Automation is key to delivering security services to a growing customer base, and Deep Security provides the scalability we need to continue expanding our business. With the Symantec Cloud Workload Protection Suite (CWP), you can discover, secure, and monitor workloads running in AWS. CWP provides security for Amazon Elastic Compute Cloud (Amazon EC2) instances, CWP for Storage protects Amazon S3 buckets with anti-malware scanning, and Symantec Cloud Workload Assurance provides cloud security posture management for the control plane. Deploy CWP as a SaaS solution to automatically protect workloads running on Amazon EC2 instances. Millions of customers depend on LifeLock to keep them safe from the threats posed by identity crime and fraud. Given this commitment, LifeLock is equally vigilant in securing their own corporate data and intellectual property. By using Symantec CWP to protect its Amazon EC2 instances, LifeLock can improve security, compliance, and auditing for workloads running on both Linux and Windows hosts. CWP integrates with AWS CloudTrail and AWS Security Hub to provide robust monitoring and visibility into everything running in their cloud environment. CWP protects workloads against both known and unknown threats with anti-malware scanning powered by Symantec Endpoint Protection technologies, real-time file integrity monitoring, application control, and OS hardening. CWP provides seamless security across our AWS and on-premises environments from a single console, allowing us to focus resources on transforming our business. applications to SAP by arranging interactions. Migrate to AWS by capturing your host server, configuration, and network states. Application profiling describes the process of monitoring applications for productivity, security, and compliance. Move existing data to a new cloud storage location with minimal disruption. Secure and protect endpoints against zero-day exploits, attacks, and inadvertent data leakage.